Every time I see a wine blend not only do I wonder what varieties are in the wine, but why are they blending the wine to begin with? Are they trying to simply create a new expression or merely blending some sub-par grapes with something else to make a better wine? Unfortunately, most blended wines tend to be either full of funky, off-flavors or rather bland. 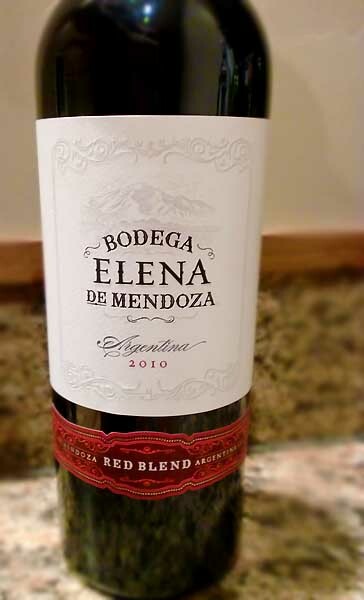 Here we have the 2010 vintage Red Blend from Bodega Elena de Mendoza, obviously out of Argentina. And what do you expect from Argentina? That's right, a Malbec. Previously I've professed my love for Malbecs, but this one is not just Malbec, but a blend with Malbec being the primary varietal at 62%, with the remainder being 21% Syrah and 17% Bonarda. Bonarda is an old-school Argentinian grape that was their primary variety prior to the Malbec explosion. This wine pours a deep red, almost purple with aromas of plums and raspberry. The fruit continues onto the palette with more raspberry, black cherries, and a touch of mild herbal notes. The acidity is pretty mild, as are the tannins. This wine is fruity and sweet, without much complexity or anything you'd look for in a more expensive wine. It's a decent everyday type of wine, maybe enjoyed while watching a movie and eating pizza, but like I said earlier, blends tend to fall into two categories, funky or bland. This one is clearly the second type. Drink This: if you want a simple, everyday fruity red wine. Don't Drink This: if you're hoping it's as good as Bodega Elena de Mendoza's Malbec, because it's not. Their Malbec is far superior, in my honest opinion. Having recently enjoyed Xtant's Petit Batard red blend, I think that Bodega's Elena de Mendoza is a less expensive but close to equal wine. I consider it to be a wonderful find!